All good things come to those who wait. And wait I shall, as we are having a new kitchen fitted. It looks like from ripping out to finished fitting will be 3 weeks, mainly due to the fact that the worktops are fitted by a 3rd party specialist company. Obviously, I wanted to try to make it as smooth as possible, so during the week that we packed up the kitchen contents, I tried to plan meals I could make in our kitchen corner in the living room. Thankfully, we retain the fridge, in the empty, echoing shell of the kitchen room. And of course, regular readers know all about my Instant Pot, (electric pressure cooker) and halogen oven in the kitchen corner. I also moved the microwave into the sitting room so Big'Un can continue to have her beloved porridge for brekkie, and given she has her mocks (practice GCSEs) this week, it seemed only fair. Monday was actually not that different from a usual Monday. The kids all had small pizzas and Papa and I had leftovers. This is because the girls have their uniformed clubs at staggered times (Big'Un is a Young Leader with Rainbows and Littl'Un is a Brownie.) Of course Tiny doesn't want to miss out on his "pizza da action" so they all have pizza as a treat. The halogen and the microwave took care of all that. Anyway, today I wanted to cook something comforting and familiar, given the unrest at home, so I thought I'd see if it would be possible to make a meaty one pot pasta dish in the Instant Pot. 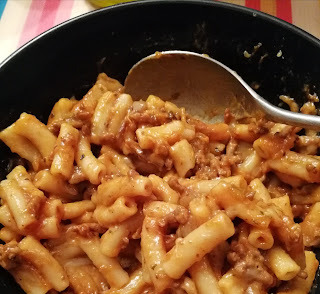 I've made and blogged about oven and hob pasta one pots, and I've made plain pasta (no drain) in the IP, so I felt it must be doable. I did find plenty of recipes online, but none really have me the method I wanted to try, so I just had a go, and it came out just right. So I felt I must share this joy!! A cupful of frozen soffritto. Set the IP to saute and then brown the meat first. Once it was browned and crumbly, I added the soffritto and lowered the flame. Now I added the garlic (powder in my case), Marigold, star anise, cumin and the herbs and mixed it all well. At this point I deglazed the pan with the slosh of wine. Once I was sure the pan was free of any stuck on bits, I added the carton of passatta and a carton and a half of water also and as soon as that started bubbling I stirred in the beef stock cube. Finally I added the macaroni and gave it all a good stir. I then sealed the pot and set it to manual for 4 minutes. When it beeped, I did a quick release of pressure and served it up with grated cheeses of choice. It was quick, easy, tasty and very satisfying to cook - even without a kitchen!